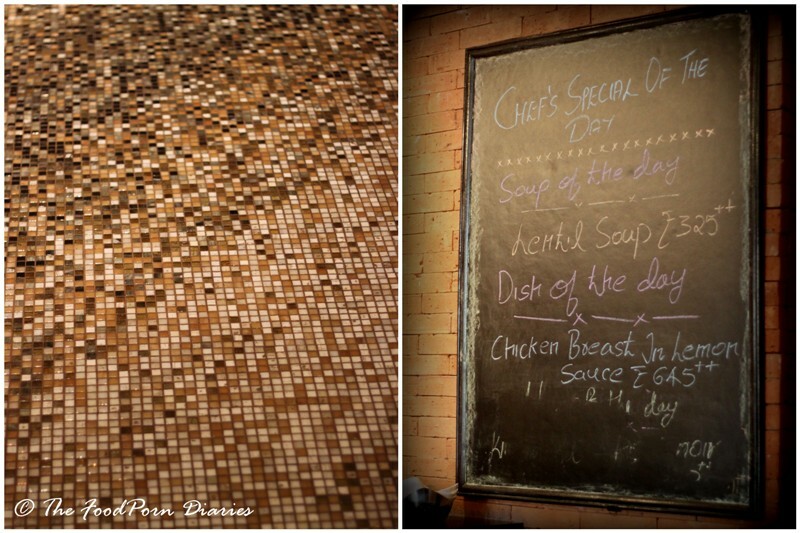 Bangalore is really being kind to people who love food. The number of restaurants cropping up every day and the many cuisines that you can eat here are amazing. It’s no wonder that people are upping the ante and offering us patrons of good food more opportunities to indulge. The ‘Food Lovers Gourmet City’ event (click here) offers prix fixe menus from 31 of the city’s top restaurants for you to enjoy. It runs from 15th – 31st of March, so I’ve been blocking my calendar and trying out signature dishes of the city’s gourmet destinations at a VFM price point. I told you we Bangaloreans had it good! Aloro at the Crowne Plaza was never on my radar (how far is electronic city!!) till this event. The menu looked too good to pass up. So a couple of us girls decided to head out for lunch. (No, this was not a kitty party :P). Thankfully one of them decided to ferry us there and I didn’t have to turn into a raving abusive lunatic while driving the car in heavy traffic. (yes that happens…sometimes… ok, most of the time!) After a couple of wrong turns and paying the wrong toll fee we finally reached the impressive building that is Crowne Plaza. 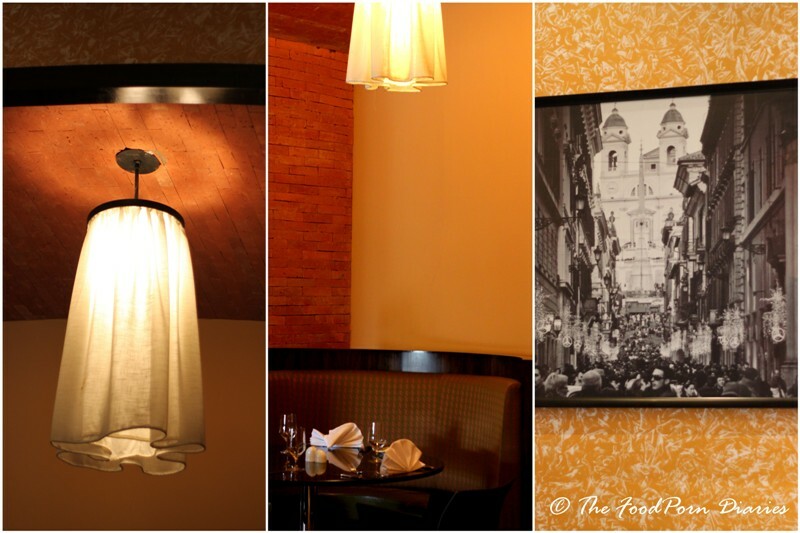 Aloro serves Italian cuisine in a cosy corner of the hotel. The warm lighting and brown and yellow mosaic flooring add to the charm. Black and white pictures of old Italian streets and buildings adorn the wall – this I really like. The tables are beautifully laid out – a shame because there were just two tables occupied for lunch that day. We were bought the Food Lovers special menus and four of us went about trying to make decisions. We opted for the three course menu. (obviously). 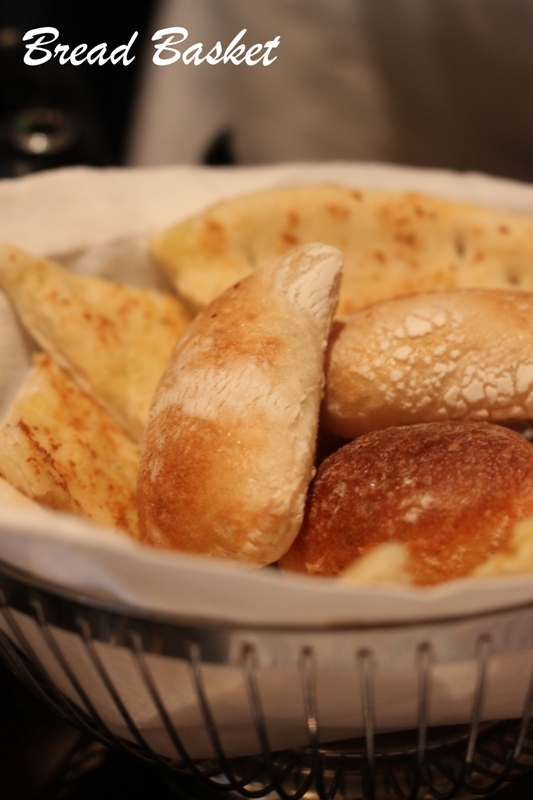 A bread basket filled with fresh bread – foccaia and ciabatta arrived. 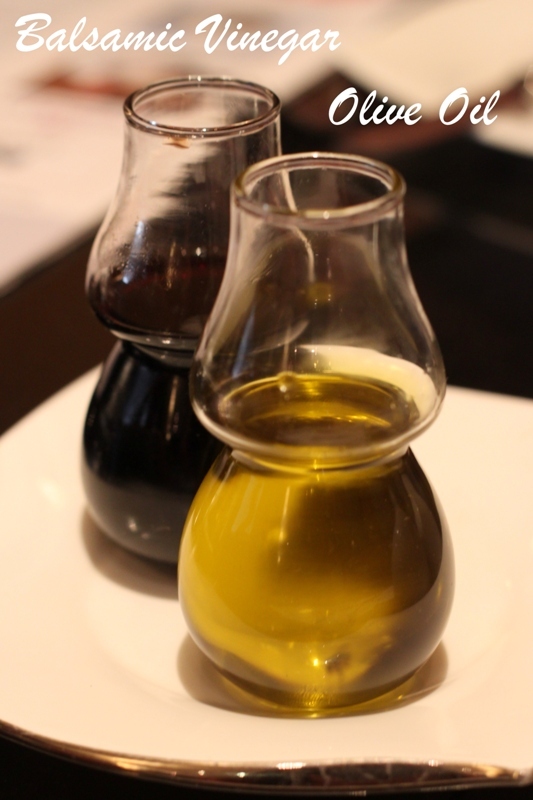 A lovely Olive Oil and Balsamic vinegar complimented the ciabatta perfectly. The foccaia was a tad under-baked though the red pepper pate saved it. I had a hard time picking my appetizer because the Burrata came with a strong recommendation from a trusted gourmand. But I had to pass it up for the much better sounding Parmegiano Ai Tre Modi. Best decision I ever made. (Ok, best decision I made that day!). 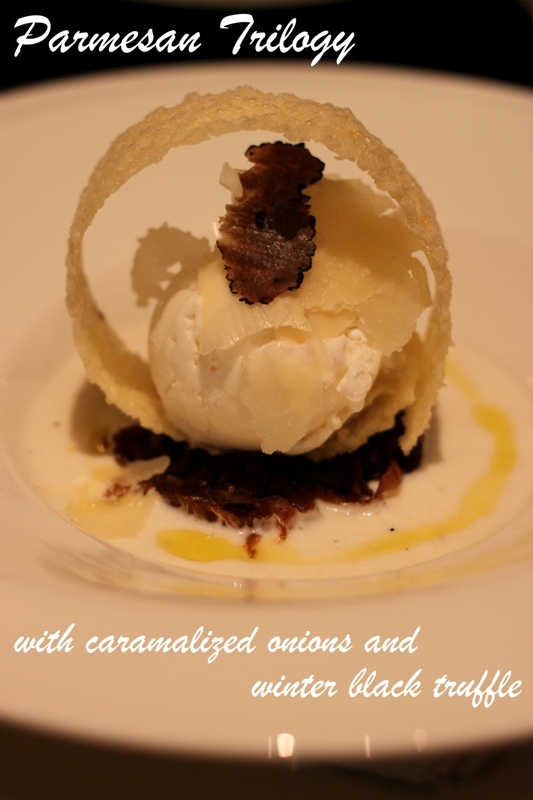 Parmesan Ice cream served over a bed of caramelized onions floating in parmesan cream encircled with a parmesan crisp and finished with a drizzle of truffle oil and a sliver of black truffle. Divine! I could have died and gone to heaven after that. It’s a good thing that three out of four on the table ordered this, because no one was willing to share! 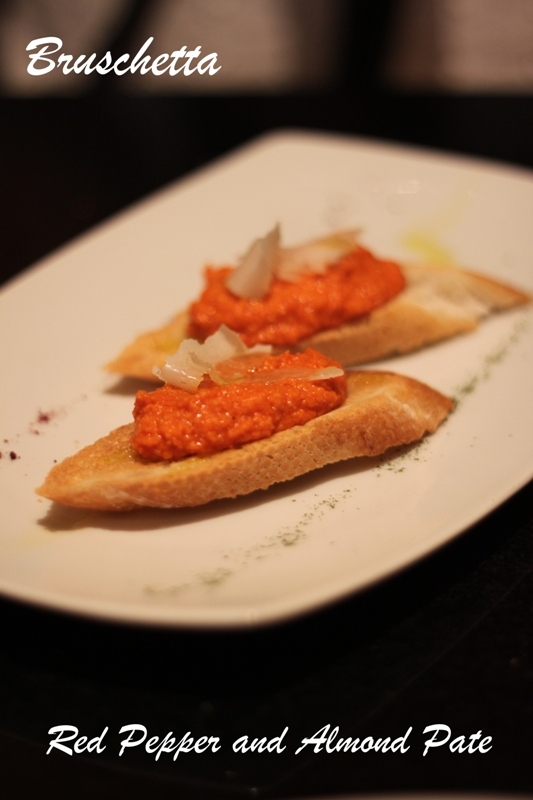 The Bruschetta of couse paled in comparison to this superlative appetizer. Nice – but nothing to talk about. Now after the appetizer the bar was raised high. Very sad, because the main course didn’t live up to it. 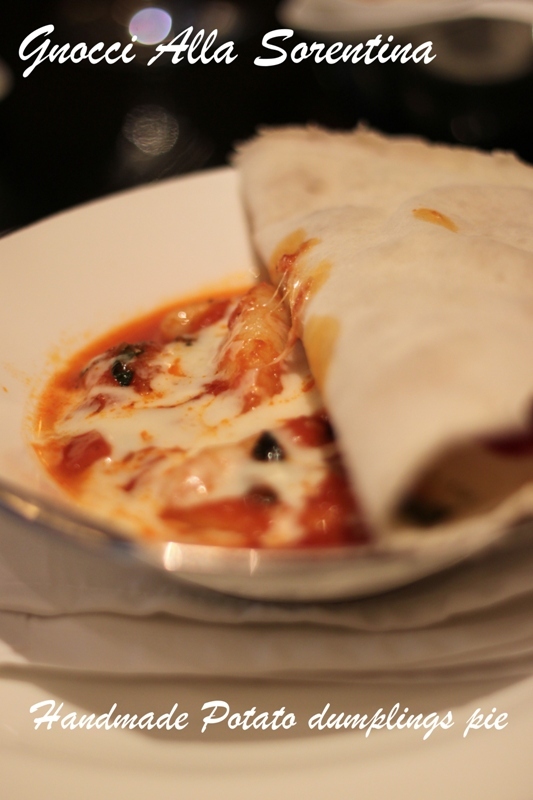 The Garganelli Calabrese sounded appetizing enough (hand rolled pasta tubes, calabrian chillies, prawn and pancetta polpotte) that three of us ordered it. When it finally arrived it was underwhelming to say the least. The prawn and pancetta polpotte looked and tasted like store bought chicken balls. 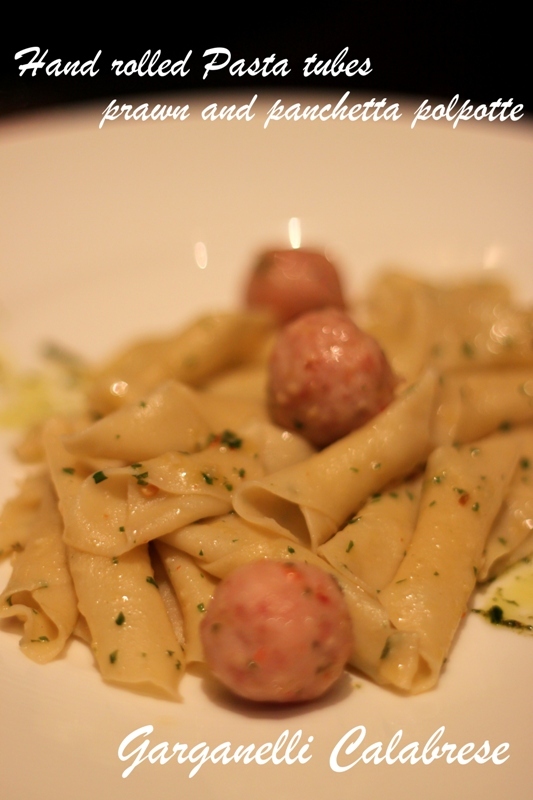 The saving grace was the hand rolled pasta and the drizzle of pesto. Time for desserts and that cheered everyone up. We opted for the Zuccoto which is a lemon cream dessert served with homemade chocolate ice cream. The ice cream was just brilliant – smooth, creamy and oh-so-chocolatey. 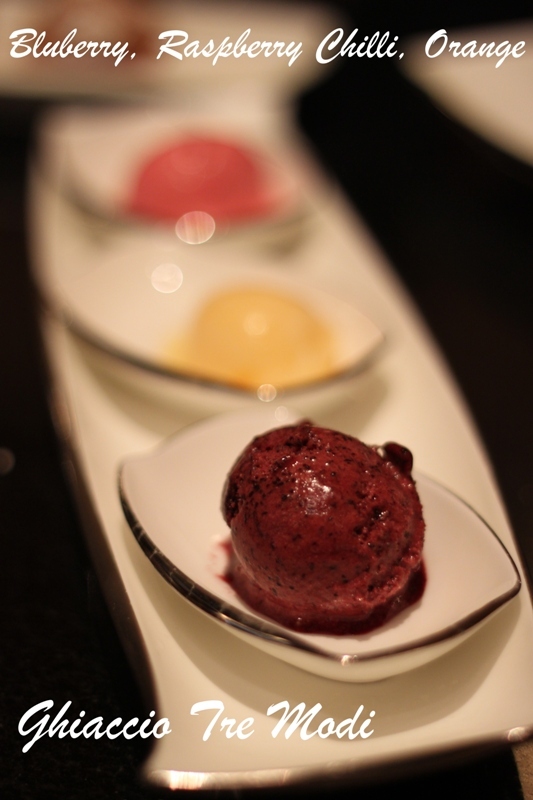 I loved the Ghiaccio Tre Modi as well – which was atrio of Italian ice creams – Orange, Blueberry and Raspberry Chilli. The last one took the podium! Yummy! 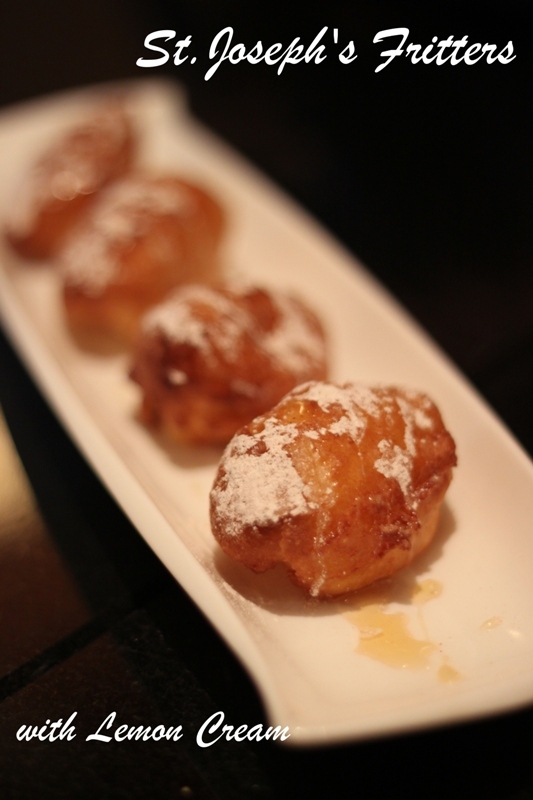 The chef maybe sensing our disappointment sent over another dessert on the house – the St.Joseph’s Fritters. This was more like a beignet (fritter with lemon sauce dusted with powdered sugar). I liked it – light, fluffy, hot and sugary. We ended our meal with a hot tea (well, one for us did!) and loads of gossip. Consideing the ride back was long and also peppered with more gossip it almost felt like a roadtrip! 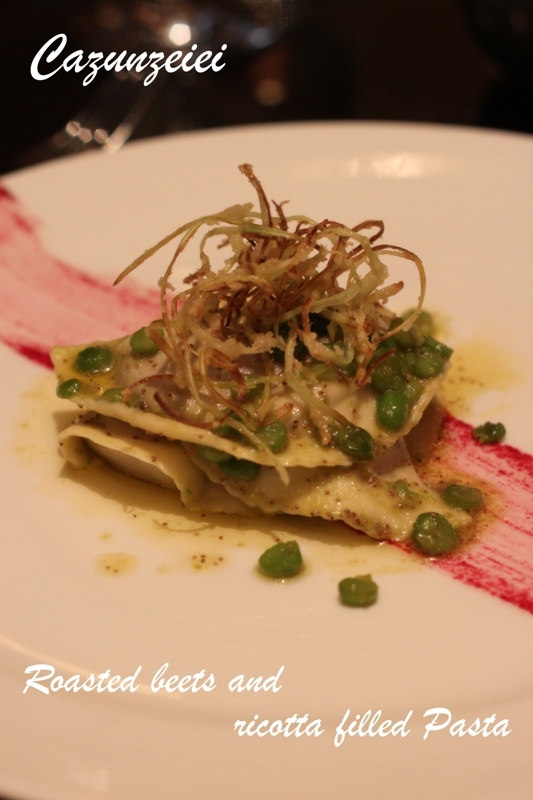 The 3 course vegetarian menu was priced at Rs.799 + taxes and the non-vegetarian one at Rs.999+taxes. 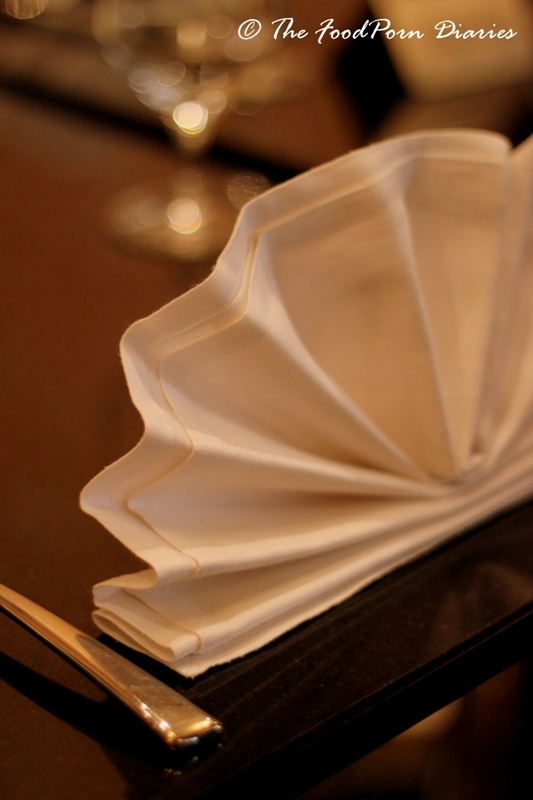 The two course menu is priced much lower. A steal just for the Parmigiano Ai Tre Modi if nothing else! Cost: Rs.2500/- plus taxes for a meal for two without alcohol. The ladies always have an enjoyable outing ;)And yes, there is so much scope for improvement.